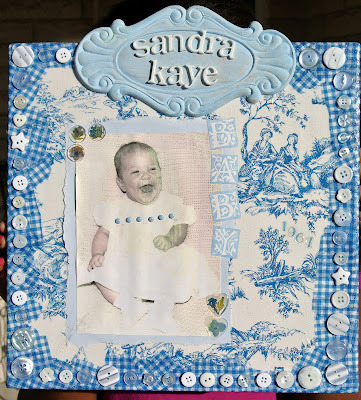 Sandra Kaye: It's My Birthday!!! Wow!! When did I get to be this age?? It seems like I just graduated from High School like maybe 12 years ago or something...but it has been 27 years????? Oh, boy!! I mean I know I have grown up kids and all but....seriously... I am only 5 years away from 50!!!! Is it me or is time just flying by?!?! Well, in the morning I am kicking off my very first linky party. It's all about getting those UFO's done!!! Please grab my new button...Help me spread the word. Happy Birthday to you! Hope you have a wonderful day with treats and cake! Nice to know you, Birthday girl! Oh and I forgot to say happy birthday. Happy Birthday Sandra! I've already hit 50 and it's a WONDERFUL age. So don't worry about that - enjoy it all! Thanks for the remind to grab your button. Happy Birthday sweet friend!!! I am on the plane on my way to Texas! I hope your day is lovely filled with lots of warm hugs from your family. Happy Birthday, Sandra Kaye! You're still so young! You're only getting better! Enjoy your special day!! Happy Birthday....March is a wonderful month I turn 55 next Monday! Happy Birthday, Hope you enjoy your day! HAPPY HAPPY HAPPY BIRTHDAY, Sandie. ENJOY!!! Happy happy happy birthday! I hope you're having a wonderful day! We are about the same age and yes... I too feel like it wasn't that long ago that I was graduating high school. Crazy how time flies! Happy Birthday! Us Creative People loose all track of Time! But don't we have fun! I didn't get a chance to stop by yesterday but I do wish you a happy birthday and hope you have the best year ever! my goodnes your looking young for 5 yrs to 50!